These are species that produce basically harmless water discoloration; how-ever, under exceptional conditions in sheltered bays, the blooms can grow and cause indiscriminate kills of fish and invertebrates from oxygen depletion. These are species that produce basically harmless water discoloration; how-ever, under exceptional conditions in sheltered bays, the blooms can grow and cause indiscriminate kills of fish and invertebrates from oxygen depletion. The blooms are represented by dinoflagellate species (Gonyaulax polygramma,Noctiluca scintillans, and Scrippsiella trochoidea) and Cyanobacterium (Trichodesmium erythraeum) (Fig. 11-1). • Paralytic Shellfish Poisoning (PSP) – Examples: dinoflagellates (Alexan-drium acatenella, A. catenella, A. cohorticula, A. fundyense, A. fraterculus, A. minutum, A. tamarense, Gymnodinium catenatum, and Pyrodinium bahamense var. compressum) (Fig. 11-2a). 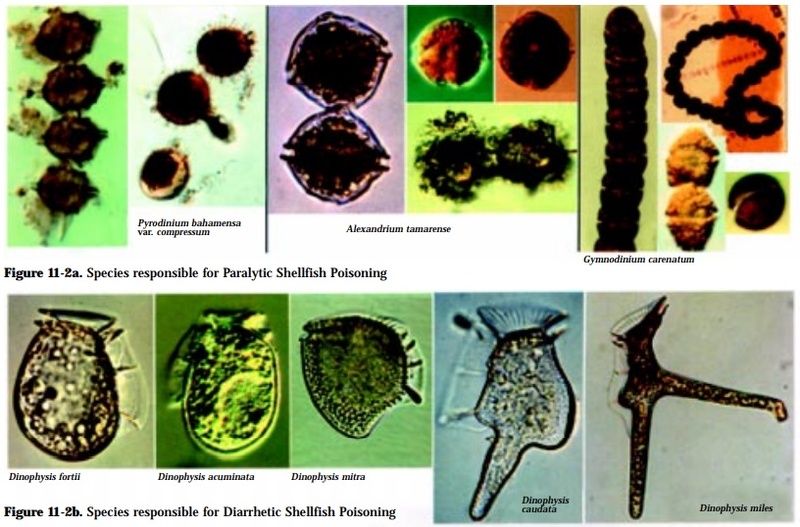 • Diarrhetic Shellfish Poisoning (DSP) – Examples: dinoflagellates (Dinophysisacuta, D. acuminata, D. fortii, D. norvegica, D. mitra, D. rotundata, Proro-centrum lima) (Fig. 11-2b). • Neurotoxic Shellfish Poisoning (NSP) – Example: dinoflagellate (Gymno-dinium breve, G. cf. Breve, New Zealand) (Fig. 11-2c). • Amnesic Shellfish Poisoning (ASP) – Example: diatoms (Pseudo-nitzschiamultiseries, P. pseudodelicatissima, and P. australis) (Fig. 11-2d). • Ciguatera Fish Poisoning (CFP) – Example: dinoflagellate (Gambierdiscustoxicus, Osteopsis spp., Prorocentrum spp.) (Fig. 11-2e). Species of this type are non-toxic to humans, but harmful to fish and inverte-brates (especially in intensive aquaculture systems) by damaging or clogging their gills. Examples are diatoms (Chaetoceros convolutus), dinoflagellate (Gymnodiniummikimotoi), prymnesiophytes (Chrysochromulina polylepsis, Prymnesium par-vum, P. patelliferum), and raphidophytes (Heterosigma carterae, Chattonella antiqua).